Speak from the heart this holiday season with a bouquet that bursts with Christmas cheer! Rich red roses and mini calla lilies are offset by stunning snow-white Casablanca Lilies, red hypericum berries and assorted holiday greens to form a warm and stunning bouquet. 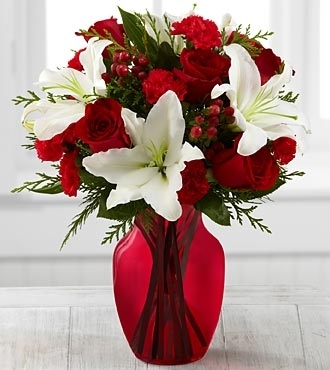 Seated in a classic red glass vase, this bouquet is a wonderful way to share in the joy of the season. GOOD bouquet includes 9 stems. Approximately 15"H x 11"W. BETTER bouquet includes 13 stems. 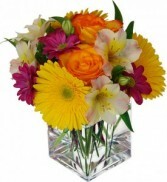 Approximately 16"H x 12"W. BEST bouquet includes 16 stems. Approximately 18"H x 14"W.